Wednesday, March 29, a silent auction and panel discussion were part of the opening reception for “Refuge in Paint,” coordinated by Awareness & Prevention Through Art (aptART) and held at the Gary Nader Art Centre in Miami. The exhibit, which includes multimedia installations and two-dimensional work, features the art of youth in Syria, Jordan, Turkey and Iraq, the work of artists local to these areas, as well as pieces donated by artists internationally. 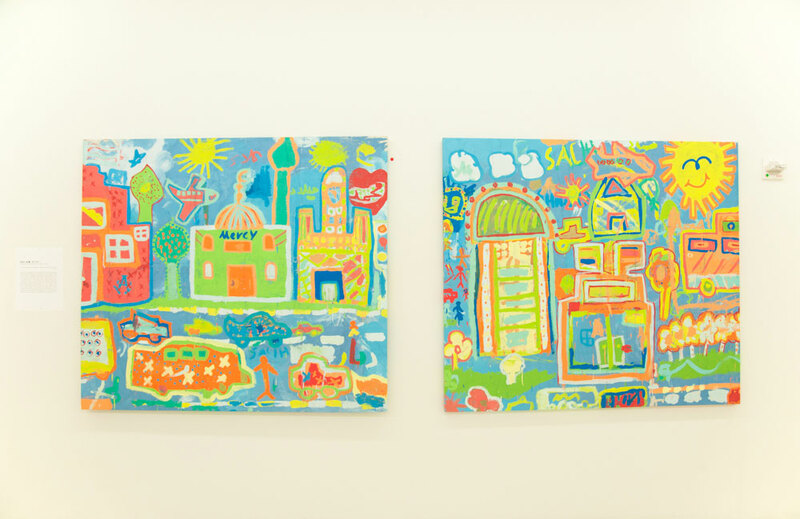 In addition to the contemporary donated pieces, the show includes individual paintings created by youth in workshops, an in-depth multimedia installation by Falk Lehmann (AKUT) and photographs by Lehmann, Jonathan Darby and Samantha Robison of the graffiti art murals created from 2013 – 2017. Samantha Robison, exhibit curator and founder of aptART, is dedicated to amplifying the voice, freedom of expression and positive engagement of youth globally. This entry was posted in art, event, middle east and tagged akut, aptArt, art fundraiser, awareness and prevention through art, falk lehmann, gary nader, jonathan darby, mural, refuge in paint, refugee, refugees, samantha robison, street art, syrian refugee.